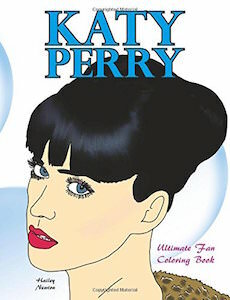 If you like to color and you like Katy Perry then this coloring book is just what you need. This coloring book by Hailey Newton brings great looking line drawings of Katy Perry for you to enjoy. This coloring book is great for hours of coloring and enjoying the musical artist you love. The Katy Perry Ultimate Fan Coloring Book contains 15 coloring images in a book that is 8.5 X 11 inch. Now you can decide the color of Katy Perry’s dress, hair, face and more as that is the fun thing of an coloring book like this.